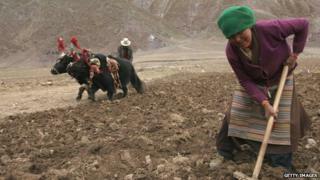 Changing farming practices could play an important role in averting dangerous climate change says the UN. In their annual emissions report, they measure the difference between the pledges that countries have made to cut warming gases and the targets required to keep temperatures below 2C. On present trends there is likely to be an annual excess of 8 to 12 gigatonnes of these gases by 2020. Agriculture, they say, could make a significant difference to the gap. This is the fourth such report, compiled by the United Nations Environment Programme (Unep) in conjunction with 44 scientific groups in 17 countries. It says the world needs to reduce total emissions to 44 gigatonnes of carbon dioxide equivalent by 2020 to keep the planet from going above the 2C target, agreed at a UN meeting in Cancun in 2010. But when all the pledges and plans made by countries are added together, they show an excess of between 8 and 12 gigatonnes per annum in seven years time, very similar to last year's report. To put it in context, 12 gigatonnes is about 80% of all the emissions coming from all the power plants in the world right now. The authors highlight a number of ways in which this gap can be closed, including tightening the rules for counting emissions and expanding the scope of pledges already made. They believe around half the gap could be closed in this way. But they say that simple changes in agriculture could cut emissions by four gigatonnes, about two thirds of the remaining difference. Emissions from farming, including nitrous oxide from applying fertiliser and CO2 from ploughing fields accounts for more than 10% of the global total right now. "The potential is enormous," said Dr Joseph Alcamo from the UN Environment Programme. "It's not with anything very exotic, it has to do with the way we apply fertilisers to our fields, it has to do with conservation tillage so you don't plough the fields very rigorously." Conservation tillage includes a number of methods including leaving the previous year's crop residues on the fields to help protect the soils. The UN cited the example of Argentina where 100 million tonnes of greenhouse gas emissions have been avoided by a shift to conservation tillage that took place in the 1990s. They argue that not only would it curb global warming, it would help poor farmers as well. "You can unite ideas of sustainable agriculture for the whole world together with ideas of controlling emissions by 2020." The report highlighted a number of other measures that could bridge the looming gap including energy efficiency, greater emphasis on renewables and reform of fossil fuel subsidies. "A lot of these actions have been done not for climate mitigation but to further national and local interest," said Dr Alcamo. The study makes the point that if action on curbing greenhouse gases isn't taken in the short term, then the possibilities of getting emissions down in the future becomes much more difficult. "Remember 44 gigatonnes by 2020 just sets the stage for further cuts that will be needed," said Unep executive director Achim Steiner. "We need 40 gigatonnes by 2025, 35 gigatonnes by 2030 and 22 gigatonnes by 2050. "At the moment the trend is in the opposite direction, we are over 50 gigatonnes." Next week, delegates from all over the world will gather in Warsaw to continue negotiations on a new global climate agreement that is expected to be signed in 2015. According to Mr Steiner, the emissions gap report shows just how much needs to be done. "This report provides a very sobering perspective of where we are and still heading and quite how far- reaching the implications are of maintaining this trajectory."